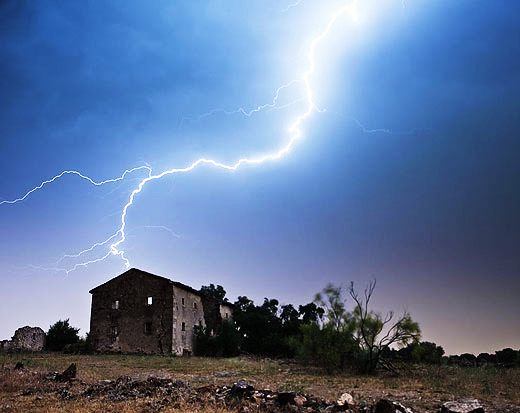 We often get asked whether metal roofs are more likely to get struck by lightning. It’s a fair question. We install high quality aluminum and steel metal roofs. Aluminum and steel, like most metals, are conductive of electricity. So logically, it seems metal would attract lighting. The truth is however, a metal roof is no more or less likely to get struck by lightning. This is because in a thunderstorm, lightning strikes the highest point. In fact, building strikes are rare. More often, lightning will strike a nearby tree or telephone pole. However, if your home is the highest structure in your surrounding area, then your risk for a lightning strike is higher. In most situations, it is not necessary to install lightning rods on your metal roof. Lightning strikes to homes are rare. If your roof is the highest point of a surrounding area, you may consider having a lightning safety system installed on your home. You can install lighting rods yourself, however we recommend you hire a professional. There are several things to consider when installing lightning rods on your home. In the event of a strike, a lightning safety system is designed to filter the flow of electrical current safely away from the home. So, ensuring it is installed correctly is key. Perhaps most important is having your lightning protection system grounded properly. A metal roof does not attract lightning. If your home is struck by lightning, a metal roof will diffuse electricity away and cannot catch fire, keeping your home safer in a thunderstorm. This is just one more reason why we at Schroer & Sons believe a lifetime metal roof is the best roof available today. Call Schroer & Sons today to learn more about lifetime metal roofing systems.